Thanks to smart phones, 2010 will be a record year for SanDisk. The outstanding question has been whether the Goldilocks NAND pricing of the last two years will hold up through 2011. Thanks to smart phones and tablets, 2011 is looking rather good. Quite possibly party-all-night good. It all comes back to supply and demand. A 5+% nudge one way or another can have a major impact on pricing, which in turn directly impacts gross margins. Balanced NAND supply and demand, or even better, slightly under supply, should enable SanDisk to clean up in 2011: $5.50 – $6.00+ EPS. Analyst current consensus for 2011: only $3.78. Interestingly it all seems to come down to tablets- the upside above smart phone growth. The magic number seems to be 55 million tablets. 50M, the current consensus, is OK.
60M, and its off to the races. Nice to have a scorecard. Bit demand is expected to rise 90% in 2011. Supply to rise 87%. At least according to Credit Suisse, 01 October, 2010. I’ve seen similar numbers around. This 3% undersupply is predicated on 50 million tablets shipped in 2011. This translates as 609% tablet growth year-over-year with tablet capacity growing from 32GB avg. 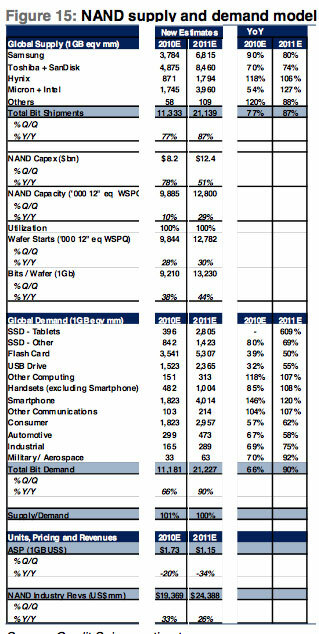 at present to 60GB± exiting 2011.
Credit Suisse (CS) expects smartphones to account for 16% of total NAND demand in 2010 and 19% in 2011. 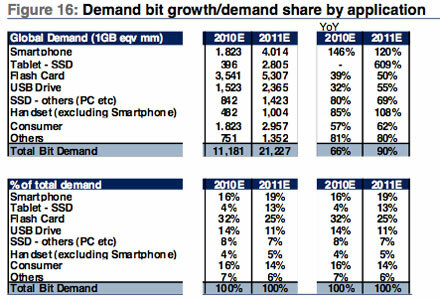 CS expects tablets to account for 4% total NAND demand in 2010 and 13% in 2011. So what’s the potential upside to this good news? For example, if tablets hit the 60M mark (vs the base case of 50M) and average NAND content increases to 72GB (vs. the base case of 56GB), tablet NAND consumption will represent 20% of total NAND supply (vs. CS’s base case of 13%) and drive NAND bit demand growth to 103% vs. the 90% base case estimate. So what are the chances of 60M tablets in 2011? Analysts have been consistently underestimating Apple’s iPad. When the iPad was announced in January 2010, consensus was that only 4M to 5M units would ship in 2010. As it turns out, Apple probably shipped somewhere around 10M in 2010. Today analyst consensus appears to be around 40M iPads for 2011. In December 2010, Digitimes noted that Apple’s China supply chain is gearing up to produce 6 million iPad 2s a month in 2011. In another report the Taiwanese-based Digitimes projected that Apple would ship 65 million tablets in 2011 based on projections of iPad LCD panel displays that are set to ship next year. 65M iPads is probably a stretch for 2011, but I wouldn’t be particularly surprised by 50M+. Apple’s competition was caught flat footed by the iPad. It has taken them a year to regroup. CES was their party. Among others, Samsung, Motorola, Toshiba, Asus, Dell, Vizio, Lenovo, Fujitsu, Panasonic, and Blackberry showed off their soon-to-be-released tablets in Las Vegas at CES 2011. HP is expected to announce their offering soon. Curiously numbers-wise not much is currently expected by analysts. Only about 10M to 15M tablets are expected to be shipped from non-Apple players in 2011. This seems low, given the stakes, the resources, and the expertise. These companies are pushing hard. And for good reason. Market share, mind share, and first mover advantage will go to the early winners in this emerging tablet market. The tablet I’m watching is Motorola’s Xoom, headed to Verizon in Q1. Xoom has the look of a winner, probably the first serious competitor to the iPad. Xoom hardware is flashy enough, featuring a video-friendly dual-core processor, a 10.1-inch widescreen HD display, a HD camcorder and a 5-megapixel camera. But it’s the software or more specifically the OS that makes the Xoom particularly interesting and promising. Xoom will include the upcoming Honeycomb version of Google’s Android software. Honeycomb has been designed specifically for tablet’s larger touch screens. It looks like we’re in for a replay of the iPhone vs Android phone scenario with tablets. Apple establishes a new booming market and shortly thereafter Google arrives enabling broad-based competition. Apple introduced the iPhone in 2007. The first Android phone arrived late 2008. In the fall of 2010, Android-based smartphones outsold the iPhone for the first time in the U.S. It took Android about 2 years to catch Apple. Apple introduced the iPad in 2010. The first tablets optimized for Android will be arriving in the spring of 2011. If the pattern holds, Android tablets will surpass the iPad in 2013. This is probably conservative. Apple doesn’t have quite the head start this time around and Google and its hardware partners are better prepared. My guess is that Android tablets will surpass the iPad sometime next year in 2012. If so, that 10 million number non-iPad tablet number for 2011 is likely low. No doubt this is not lost on Apple. And all the more incentive for Apple to ramp the iPad 2 as quickly as possible in the highest volumes possible. Is so, that 40M iPad number for 2011 is likely low. If so, 60 million tablets in 2011 is likely low. If so, NAND is going to be tight- all year in 2011. Of course, lots of things could go wrong. The world economy could tank for one. Component shortages could stifle growth for another. That said, fundamentals are looking rather good. Smart phone growth could easily top estimates. Bit growth itself could fall short. The Micron/Intel JV in Singapore looks to be ramping slower than anticipated. Yield issues loom for all players on 2Xnm. And last but not least, bit supply estimates are counting on significant viable X3 from all players. To date only SanDisk appears to have met those challenges. The beauty of the current market, from a SanDisk perspective, is that both the smartphone market and the tablet market have entered a rapid-growth stage, with current NAND pricing. This entry was posted on Sunday, January 9th, 2011 at 5:39 pm and is filed under Uncategorized. You can follow any responses to this entry through the RSS 2.0 feed. You can leave a response, or trackback from your own site. Hey Savo! Hope all well. Great post. Not sure if you saw my post of the Goldman semi report over on IV, but even Goldman has 55 million Tablets projected for 2011…but, well, we all know how Goldman tends to overestimate NAND demand…. Not!!! Keep up the great work. Thanks for pointing out the Goldman Semi report from 2 January. I was traveling when it came out. I pretty much agree with your comments on IV. 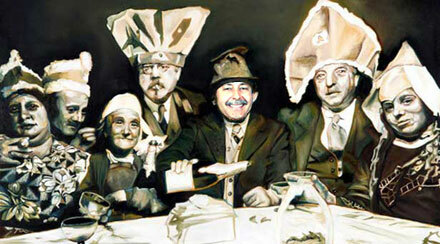 With Goldman it always seems to be a curious mix of corrupt, incompetent & some insight. Have you read “The Big Short: Inside the Doomsday Machine” by Michael Lewis? A good read and most revealing about how Goldman operates. Regarding the 2 January report, I find it remarkable that Goldman completely misses the big deal with both smart phones and tablets: these markets are so hot that NAND price elasticity isn’t in play. In the 2 January report Goldman talks about how NAND pricing needs to decline 30%-40% YoY from current levels to stimulate meaningful growth for tablets and smartphones. Stimulate growth? Heck the pedal is already to the metal. NAND pricing is as strong as it is today precisely because smartphone and tablet players have far bigger worries than a few NAND dollars here and there. The 21st century gold rush is on. BTW, my guess is that the 55 million tablets Goldman estimates for 2011 is simply a rounding up of Gartner’s 54.8 million tablet unit sales number. This comes by way of a survey conducted by ChangeWave. Not surprisingly, the Apple iPad is by far the most popular tablet device being provided by companies to their employees. It accounts for 82% of the corporate tablet market, compared to 11% for HP (Slate) and 7% for Dell (Streak). The iPad owners are happier too with 69% very satisfied and 28% somewhat satisfied. When HP Slate corporate users were polled, only 23% were very satisfied and 46% were somewhat satisfied. Perhaps the most interesting statistic to come out of this survey, though, is the explosive growth expected in the next quarter. An incredible 14% of businesses surveyed say that they will be buying tablets in the first quarter of 2011. That’s double the current demand, representing almost exponential growth. It won’t be long before outfitting employees with tablets could become just as commonplace as outfitting them with smartphones. Thanks for pointing out the enterprise angle to the tablet story. Rimm and its Playbook tablet seem like the enterprise front runner or at least Rimm seems to be the player most clearly focused on the enterprise potential of tablets. A few million tablets here and a few million there, add up to big numbers- and a lot of NAND to feed the 2011 tablet frenzy. As I’m sure you are aware, analyst estimates for tablet sales in 2011 are all over the place. Consensus is that 2011 will be really really big. The question is, how big -really really big- will be? Back in November- Citi said 35 million. Also in November- FBR Capital Markets estimated 70 million tablets in 2011: 40 million tablets sold by Apple next year and 30 million by the rest of the pack. Then there is DigiTimes, also November, for 2011: 70 million iPads + 30 million tablet computers from others = 100 million. FWIW, my take is that the Apple / Google tablet struggle will not be a zero sum game. Both will be winners. Notebooks/Netbooks will suffer a bit. This is a new game. No one knows quite where this is going other than it’s going to be really really big.